When Little Owl falls from his nest and opens his eyes for the very first time, he isn’t quite sure who he is. ‘Whooo? Whooo? Whooo am I?’ he asks each animal that he meets, but no-one can help him. Will Little Owl find here he belongs? With a format reminiscent of P D Eastman’s classic Are You My Mother?, Little Owl follows the adventures of a baby young as he approaches various animals trying to find out ‘whooo’ he is. This story has a wonderful Australian setting, however, and Little Owl interacts with each animal he meets, trying to imitate them until he scares them away with his ‘whooo’ questions. Little Owl is a lovely introduction to some of our most familiar Australian wildlife – sugar gliders nibbling on flowers, cranky cockatoos scratching at the ground, croaky green frogs by the billabong and many more. Little Owl tries to mimic each one, but it isn’t until he finds his mother that he discovers someone else who appreciates his hooting call. 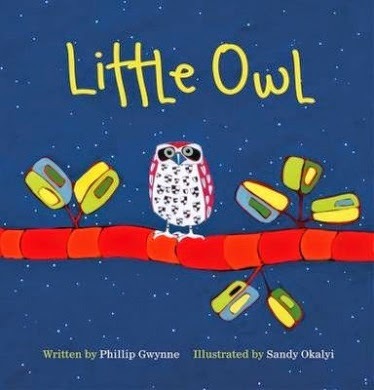 Young children are sure to enjoy the reassuring repetition of Little Owl’s encounters with the various animals in this engaging story by well-known Australian author Phillip Gwynne. Sandy Okalyi’s colourful illustrations are filled with personality and add a real visual appeal to Little Owl’s encounters. My favourite is Little Owl stretching his neck to imitate emu. A wonderful Australian adventure perfect for little ones at bedtime.